We are pleased to inform you that you have been formally invited to the Wizarding World of Harry Potter! The magical theme park is located at Islands of Adventure and allows visitors to enter their favourite scenes from the films, including the Hogwarts Express, Hogsmead village, Zonko's Joke Shop, and Diagon Alley. It also has thrilling rides such as the Flight of the Hippogriff and Dragon Challenge. Children can visit Ollivander's to find their perfect wand, or sample chocolate frogs and Bertie Bott's Every-Flavour Beans at Honeyduke's sweet shop. The attraction is wildly popular and fun for the whole family, but be warned that queues can be exceptionally long at peak times. 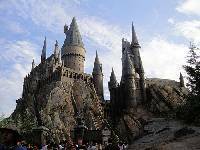 Harry Potter fanatics give the park rave reviews, but even those who are unfamiliar with the wizarding world will be enchanted by the park. Admission: $90 per day, package deals are available.